Jay: Hey everybody. It’s Jay Baer from Convince & Convert, joined today by a very special guest, prolific author, public speaker, consultant, and futurist, my man Phil Simon live from Las Vegas, Nevada. What is going on, good sir? Phil: Hey Jay. Thanks for having me, but never mind the slot machines in the background. Jay: Are you at the airport? That seems to be their MO there. Phil, your new book, which I love, love, love is called – here it is right here The Age of the Platform. Outstanding read. Really fascinating stuff. This is a little different than what you’ve written about in the past. How did you get this platform concept to come together for you? Phil: Well, Jay, I heard quite a few people talking about platforms, but I felt like everybody was doing it in an inconsistent manner. So I thought, why not write a book that defines it as this new business model, because after I’d written the last book, The New Small, I was intrigued about companies that were doing things in an interesting way, but they were 10, 15, 20 employees max. Well, what about companies with ten, fifteen, twenty thousand employees? Which companies were acting small? So you put those two things together, and the fact that I don’t sleep and type really fast and have a lot of opinions, and voila, another book. Jay: It’s great. And you actually produced this book through your own new publishing company, and also got it off the ground with Kickstarter. Tell me about that process. That’s a really interesting way to go about a book project. Phil: Thank you. I had actually used Kickstarter on the last book as well, and had learned from, not necessarily my mistakes, but things that I could have done maybe a little bit better. So to me, keeping in this notion of platforms, Kickstarter is a plank in my own. And it doesn’t have to be just me. Certainly I wasn’t the first or only author to use Kickstater to fund his project. Yes, you can put out an eBook or even a basic book for relatively little money, but if you want it to appear professional and you’re trying to use it to fuel other parts of your own business, then that costs money. Cover designers, proofreaders, editors, indexers. So I thought, aside from raising money, why not raise awareness? And Kickstarter I think is great for both purposes. Jay: You talked about the Gang of Four in the book, the four companies that you’ve mentioned. How is it that those four companies, those four large technology organizations have become the premier platform providers of the modern age? Phil: That is a very good question, and it’s one that I explore in the book. The short answer is that they aren’t afraid to fail. They’re constantly introducing new planks. Certainly you and I were just talking before about Google+, and some people would say, “Is Google trying to become the next Facebook?” I would argue no, but think about it from Google’s perspective. If I had to go off of the Google platform to be social, I may not come back. This is why Google has spent millions of dollars, I’m sure, on Orchid, on Buzz, on Wave, and now it finally got it right with Google+. So to me it isn’t, Jay, so much a matter of the technology, although these companies certainly have amazing technologies. It’s about the leadership, about the management style. If you look at Jobs and Zuckerberg and Larry and Sergey and Jeff Bezos, they made bets when other people said, “You guys are crazy.” I think that in this new age, the age of the platform, anyone who says, “Oh, I’ve got this five-year plan. I’m going to stick to it come hell or high water,” I quite frankly think is delusional. Jay: It’s interesting that you talk about Google and Amazon and Apple and those guys. Some people have criticized Google in particular for not being as platform-like, because it’s not as well integrated as some of the other companies that you mentioned. For example, Google+, they’re trying to integrate it now, and they’re doing an okay job. But Google sometimes feels like a collection of products that happen to share a logo, as opposed to a unified, shared vision of the world. Maybe that’s just their engineering culture and their ability to experiment and being unafraid to fail. But it doesn’t feel as stitched together as some of the other players out there sometimes. Phil: I don’t disagree with you, but I would counter that when Google makes a plank available, like Google+, first it did it, and it was kind of awkward and there were some tweaks that they made in private beta. Eventually, they opened it up to the masses, and it made those tweaks, and in fact, I think it was two months ago Google finally made some APIs open. So you actually could, if you’re a developer, connect to them. So, while something may not be integrated from the get-go, I would argue it tends to become more integrated down the line. But again, this is in keeping with this notion that these platforms evolve. No one wants to be, I think, on a standalone service if they can help it. It’s one of the reasons I don’t necessarily have high hopes for Netflix or Hulu or some of these standalone companies, or even Yahoo. So to me, we’re spending more and more of our time, as you know, on a Facebook. Amazon launches the Fire primarily because you can buy stuff on Amazon no matter where you are. You don’t even need to have your computer. So I agree with you, there is this trend towards increasing integration, and if it isn’t there from the beginning, I think it certainly improves over time. Jay: Is Yahoo! an example, then, of a company that had a platform at one point and kind of screwed it up, or did they never really have it? Phil: It’s an interesting concept. To me, platform is sort of the integration of a number of different planks. But if you want to be one of these great platforms, you have to talk about open APIs and software development kits. And there certainly are Yahoo APIs, but I think that the company kind of got complacent with portals. It’s still this incredible web property. Yet, if you’re a hot developer right now, you want to work at Zynga or Facebook or Amazon, not Yahoo!. In, I think, it’s Chapter 10 of the book, I write about the ephemeral nature of platforms. In other words, if you are AOL or Yahoo! or MySpace, you may get to a certain point, but that guarantees nothing. By the same token, there’s no guarantee, as you know, that Amazon, Apple, Facebook, and Google will be as prominent in five years, unless these companies are constantly reinventing themselves, and even then, there’s no guarantee. So I thought that it was really fascinating to take a look at these companies, because while they may have attained a certain status, in five years, we may be laughing about them. Jay: Given their background of the current Gang of Four, is Amazon sort of the least expected of them? It was a bookstore, literally. That was all it was, was a bookstore. In fact, you may have seen the post that came around a couple weeks ago that showed original homepages of popular websites, and Amazon was one of those. I remember that quite vividly. I was one of the first few hundred customers of Amazon ever, and I have a coffee mug that they sent the first 500 customers. I still have it. I’m going to sell that sucker someday for big money. It was literally a fairly modest concept at the time. Buying books online seemed weird, but it was just a bookstore. And now all of a sudden, I think Amazon is the company that people don’t really understand how many tentacles they have and what they’re working on with the cloud. They just don’t talk about it very much, but they are a serious, serious force to be reckoned with that doesn’t get the same kind of love from consumers that certainly Apple or Google do. Phil: Did you see that infographic on Amazon? It showed graphically how big Amazon is and how it had bigger GDP than some countries that you’ve actually heard of, and it does more in retail sales than Wal-Mart and all these other big companies combined. But to your point, this wasn’t expected, because when Bezos started the company in ’94, he just said, “I want a place that people can sell books.” Is it the most unexpected, to answer your question? It’s a tough one to answer, because when Facebook just started as a Harvard experiment or when Google started as a search engine, who could possibly have foreseen that these companies would have become . . .
Jay: Yeah, and Apple was an edge case for a long time until they decided to get into music. Phil: Yeah, so to me, I thought that the evolution of these companies and the platform as a business model really was intriguing, because if you stay still . . . and I’ve done this with my own business. The buzzword these days is pivot. If you think that the way you made money five years ago is the way you’ll make money five years from now, you may be right. But it’s just a different time right now. In the book, I write about how there are accountants in India that do American taxes and they do it well. Who could have imagined that 10 years ago, but now with the tools, with the sharing, with broadband, with video Skype like we’re talking on now, it’s this very uncertain time. If there’s something that these platform companies do really well, Jay, as you know, it’s that they embrace this uncertainty. Jay: It seems that increasingly, these four are on a collision course. They keep trodding on each other’s front lawns. How does that end up? What do you see in your crystal ball as the end game? Phil: Let me put on my genie hat here. It’s an interesting question, and Fast Company just ran an article about the great tech war of 2012, and they featured the Gang of Four. And I nearly fell off my treadmill at the gym when that came on TV, because I thought, “Wow, maybe I’ve written a pretty topical book here.” I don’t see, though, that there is this one winner. It’s hard for me to imagine Google supplanting Facebook in social or Apple selling more books than Amazon. But I think that they’ll form these sort of tenuous alliances, but they’ll often step on each other’s toes. Certainly they’re battling in many areas right now, particularly if you look at video and music. Google, Apple, Amazon, and Facebook, I think it’s only a matter of time before there will be some pretty interesting wars. As to who will win, I’m not smart enough to tell you. Jay: That is not true. You just refuse to tell me. How come Twitter is not on that list? So many times, certainly in my world, in the social media consulting world, people always say Twitter in the same sentence as Facebook, perhaps incorrectly, given the extraordinary advantage that Facebook has in usage and penetration. But it’s always Twitter and Facebook. How come it’s not a gang of five? How come Twitter is not part of that? Phil: It may very well be by the time this goes live. It’s very difficult to predict, and in the back of the book, aside from talking about platforms that have declined, like Microsoft to some extent, AOL, MySpace, Yahoo!, I also talk about platforms that are ascending, certainly LinkedIn, Twitter, Force.com, even Adobe. So, it’s hard for me to say that Twitter will never get to that point in terms of penetration and market capital, whatever your metric would be, but they’re certainly doing things that are platformesque. They have open apps. There are something like a million different services based on the Twitter open API. Even with the Twitter redesign, I would argue that it’s becoming almost grown-up. I think that when Jack and Biz developed the company – I’d love to get your thoughts on this – they didn’t really know what they built. Jay: I’m glad you mentioned how this applies to your own business. You wrote a guest post here at Convince & Convert a while back about that premise of turning your own business, Phil Simon Systems, into a platform and using the Gang of Four as a model for growing additional planks and tentacles for yourself. Can you talk about that a little bit and how any business can be a platform? Maybe not “the” platform the way Apple and Google and Facebook and these guys are, but A platform. Phil: Sure. In 2008, and I write about this in the book, I had my best year ever as a consultant. I made a lot of money. I was always billable. But it was from one very specific type of consulting, and at the time I was 36 years old, and that scared the hell out of me. I thought to myself, “You’re never going to have a year like this again, and you don’t want to spend your whole life going, ‘Gosh, I wish it was 2008 again. '” So over the course of three years, I started a publishing company, I started a public speaking practice, I started podcasting, creating cartoons, doing different types of consulting, website design. Now, I didn’t start teaching ballet lessons or golf lessons, because I’m not really qualified to do either, but I got into these natural extensions of my current business. And it wasn’t that much of a stretch, and that’s exactly what Google did. Once it launched Gmail, maybe people don’t want to just email. Maybe they want documents or maybe they want maps. So they launched these things that, to your point, maybe aren’t totally integrated the way they should be. But there’s no reason that, if you are a website designer for instance, you can’t offer some social media consulting. Some people, “Yeah, I just want a WordPress installed and some CSS,” but they want to use that website. So to me, why leave that money on the table? Why not embrace some sort of partnership or hire some people, or even on a project basis? That way, you’ve got multiple lines of business. That way, if people turn away from WordPress, which I don’t think will happen, at least you can still do that social media consulting. So, it is about not just having a one-plank platform, even if, if you’re Google, that plank being search, and you make billions of dollars a year. They’re smart enough to realize that the traditional index search could be under siege from something like Facebook with social search. Jay: It is very well-written, and it is a very interesting book to take in. I read a lot of books. It’s part of what I do, and this is one of the more interesting books that I have read this year, no question about it. 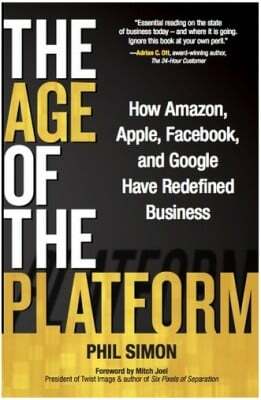 From Phil Simon, it is The Age of the Platform. Take a look. You’ll like it a lot. You’ll learn a lot, and it’s a really fascinating read. Thank you for the time. Congratulations on the book and all your success. It’s a treat to have you. Phil: Thanks for having me, Jay.